Occasionally we come across a product that bestows an immediate glow, changing our look (for the better!) in an instant. Since we’d be remiss to keep them to ourselves, we highlight these genius finds in our Instant Makeover series. Waterproof mascara can leave lashes stiff and is a total pain to remove, so I don’t even own a tube. This presents a problem when I’m, say, invited to a pool party or decide to hit the gym after work. BareMinerals Locked & Coated Waterproof Lash Top Coat ($12, bareescentuals.com) is the brilliant solution. 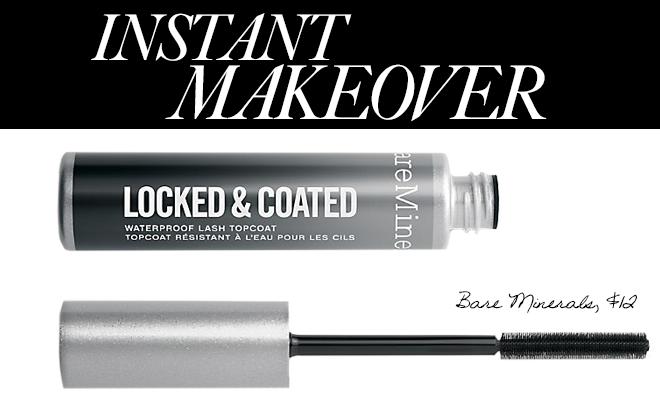 This clear top coat goes on over any mascara to create a waterproof seal — like a raincoat for your lashes. The invisible formula doesn’t make lashes feel stiff like waterproof mascara does, but it’ll keep you from looking like a smeary-eyed celebrity mugshot through swimming, sweating and (aw) sobbing. And miraculously, it’s no harder to remove than regular mascara. I’m keeping one in my purse in case of a sudden rainstorm.